The Iron Tongue of Midnight by Beverle Graves Myers, a Mysterious Review. 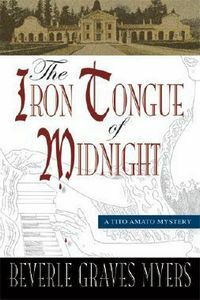 Review: The fourth Baroque mystery in the Tito Amato series by Beverle Graves Myers, The Iron Tongue of Midnight, has the opera singer, among many others, rehearsing a new opera at a country house in the mainland hills of Venice when murder makes an unexpected entrance center stage. Vincenzo Dolfino, master of the Villa Dolfino, and his wife Octavia, an operatic soprano, invite Karl Johann Weber, a German composer, and his opera company to their home to rehearse and prepare for the presentation of Weber's new opera in Venice during the holidays. When a stranger is murdered on their first night at the villa, stabbed with the pendulum of a clock, no one admits to knowing him. The local constable is away on a boar hunt, so the inquiries into the murder are left in the capable hands of Tito Amato who, in addition to his role as a singer, is known as an amateur sleuth. With a house full of servants and members of the opera company, the scenarios of what could have transpired were overwhelming. And each person has a secret of some kind that could be fatal to his or her career. One by one these indiscretions are revealed to Tito. He is told of a precious jewel theft and even a murder, if only in self-defense, but none seemed to have anything to do with the dead stranger. Tito has to sort fact from fiction and discover who the stranger is before he is doomed to death by the hands of the clock. The Iron Tongue of Midnight is a mysterious, fascinating, and often thrilling journey into the lives of the wealthy and powerful that reside in the 18th century Venetian countryside. The depictions of the region are so powerfully vivid that at times it seems one can smell the sweet fragrances of the vineyards where the grape vines grow. And intertwine, not unlike the intricate plot of this story. The delightful mix of characters is splendidly drawn and their secrets, and whether they remain hidden or are exposed, add a sense of intrigue and adventure to Tito's investigation. The Iron Tongue of Midnight is an exceptional period piece of mystery fiction and is highly recommended. Special thanks to guest reviewer Betty of The Betz Review for contributing her review of The Iron Tongue of Midnight. Acknowledgment: Poisoned Pen Press provided an ARC of The Iron Tongue of Midnight for this review.